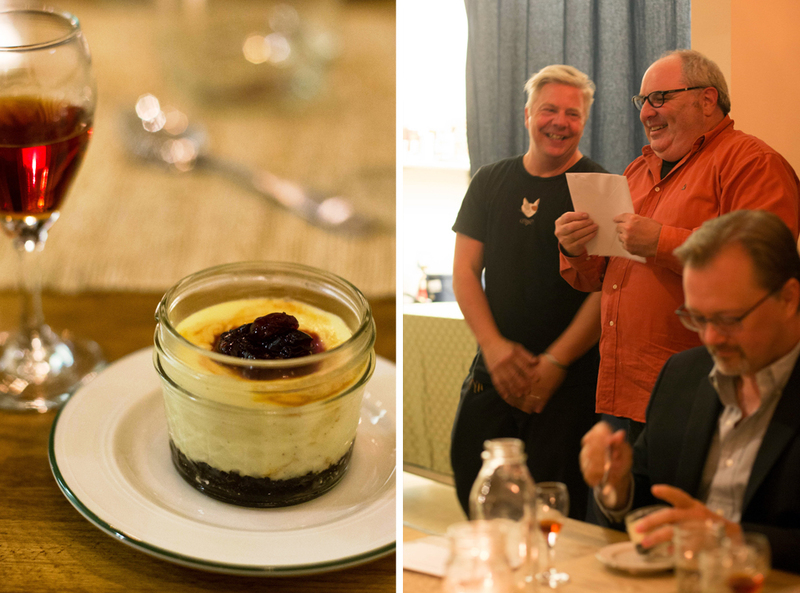 Portland Food Adventures started its 5th year with dinner at Adam and Jackie Sappington’s Country Cat, in their private dining spot – the Calico Room. 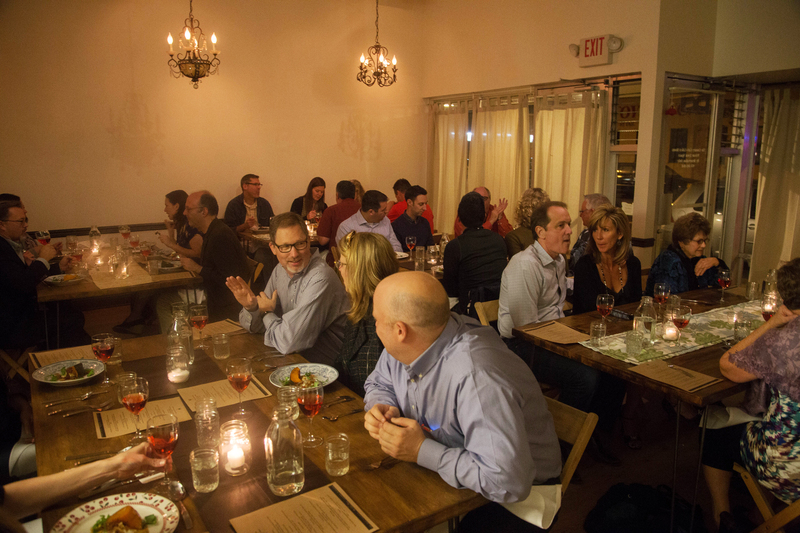 Country Cat has become a staple of the east Mount Tabor neighborhood, and is often busy for both brunch and dinner services. We were started out with a variety of appetizers including Country Cat ham and Dijon salad on mini biscuits, chunky smoked trout on house made potato chips, and pacific oysters with pear mignonette. 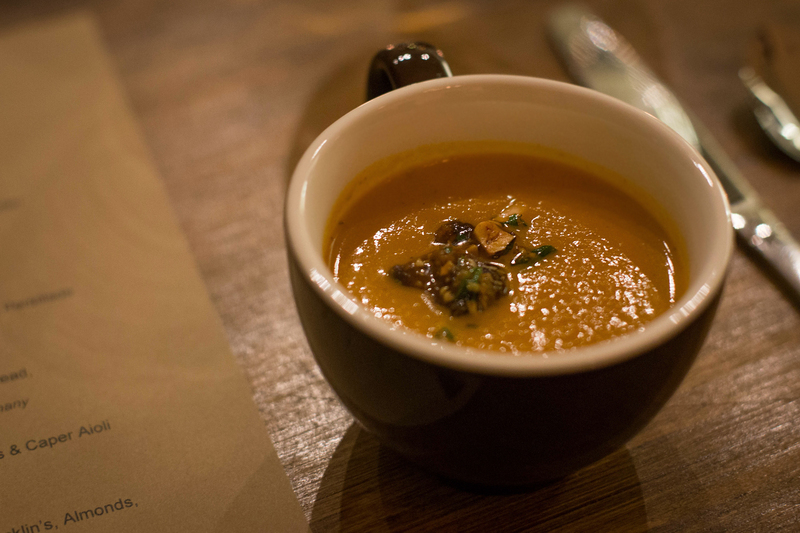 This was a very seasonally appropriate menu, with the second course being a hearty caramelized sunchoke and sweet chili soup with chorizo and hazelnut persillade. 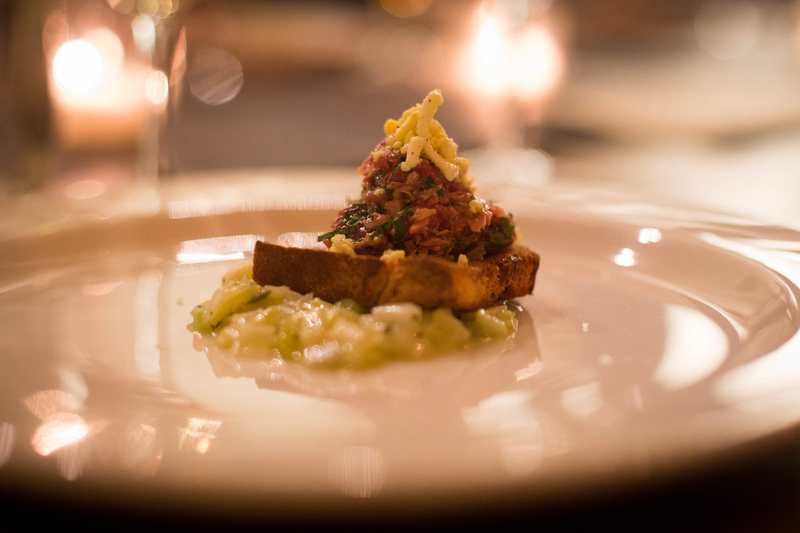 Above was our second course, a chilled beef vetaloni with wild mushrooms, fried potato bread, truffled egg and leek vinaigrette, served with a 2011 Wiltinger Riesling. Adam Sappington came out to talk a bit about the progression of Country Cat, which he opened in 2007, and explain a bit about the menu tonight. 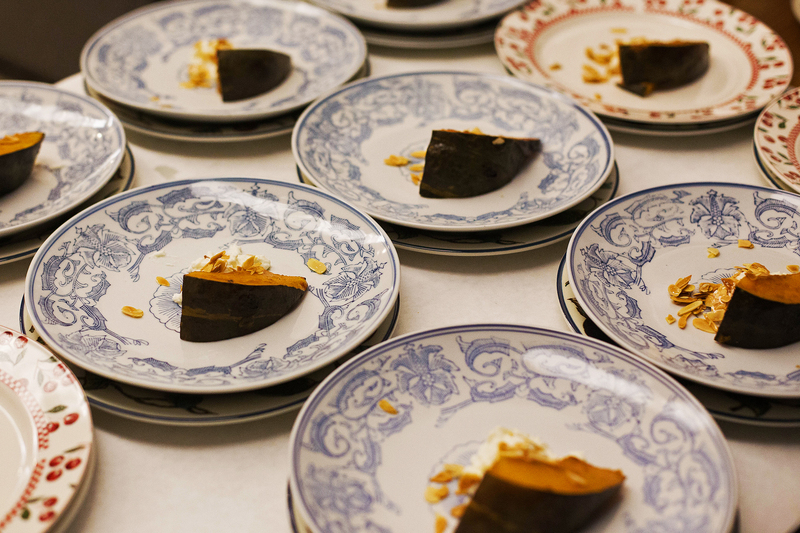 We had a rather specialized menu, taking inspiration from the traditional dishes and elevating them a bit for our particular dinner. 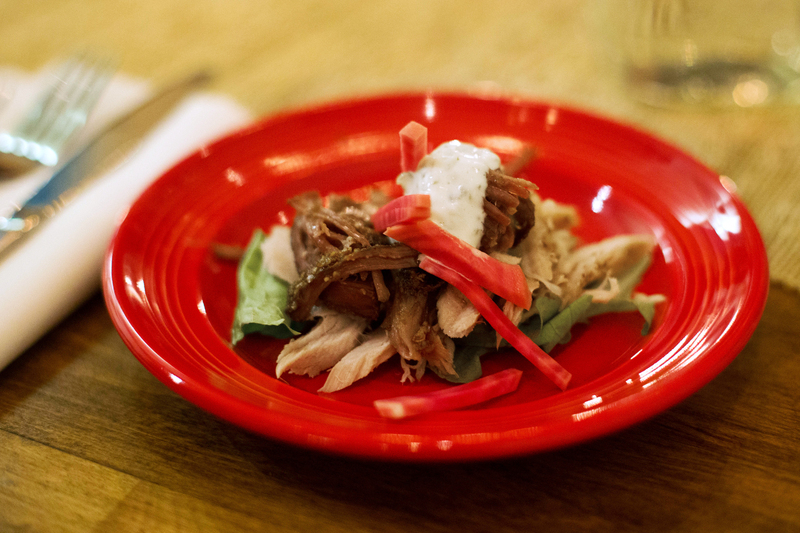 Our third course was a confit of pork neck and albacore tuna, with pickled bullseye beets and caper aioli. 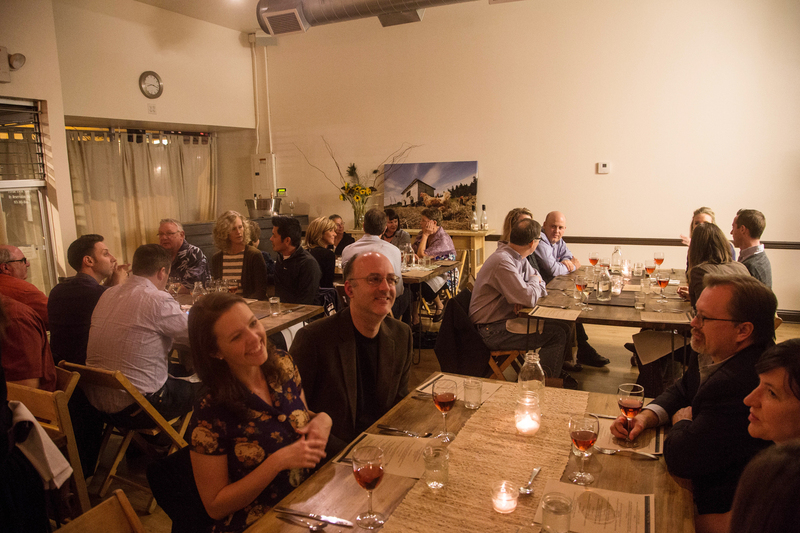 The Calico Room was beautifully set up, with the kitchen right near the diners for a real interactive experience. 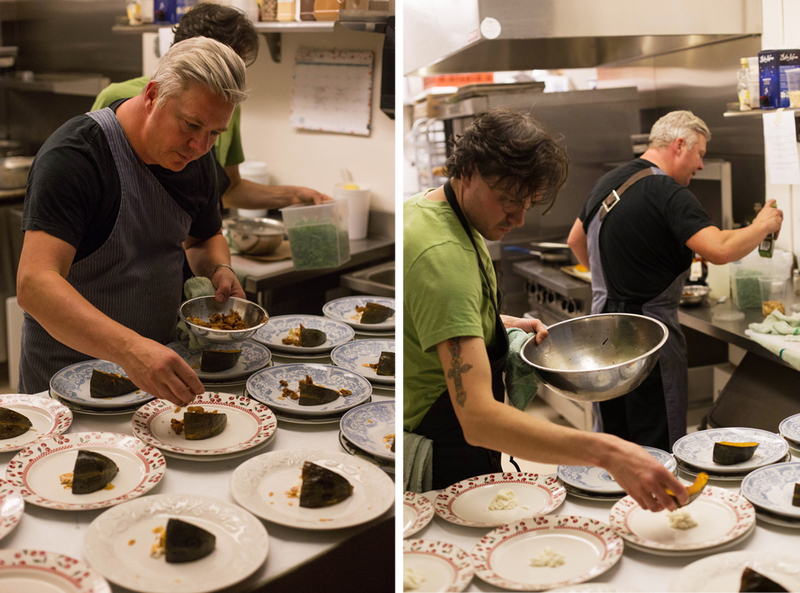 I managed to get a few shots of the kitchen at work, plating our next dish. 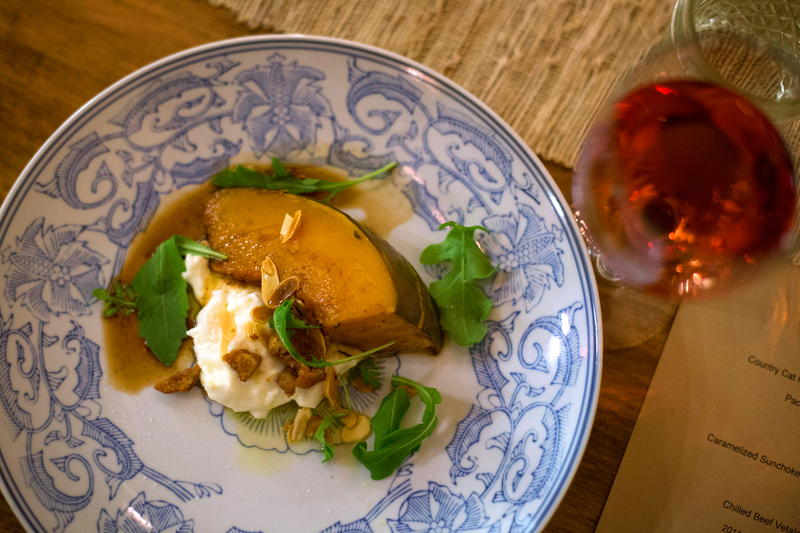 Below is one of the most loved dishes of the night, a salad of Kabocha squash, pumpkin spiced buratta, Duck Cracklin’s, almonds, arugula and saba, served with a 2012 Pinot Noir. 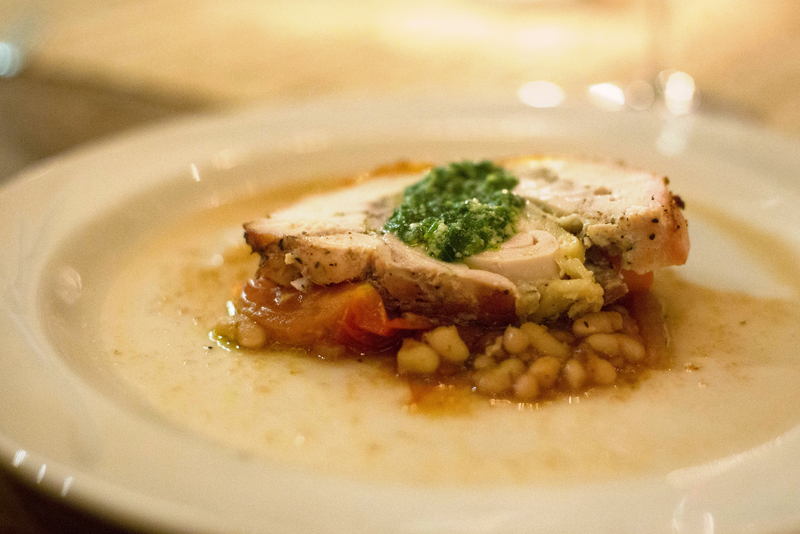 Our last main course was a boned, cured and rolled chicken on a slow braised autumn vegetable ragout. Adam came back out to tell us about some of the fantastic gift certificates we got this time around, which included Smallwares, Flying Pie Pizzeria and Por Que No. Some of my favorite spots! 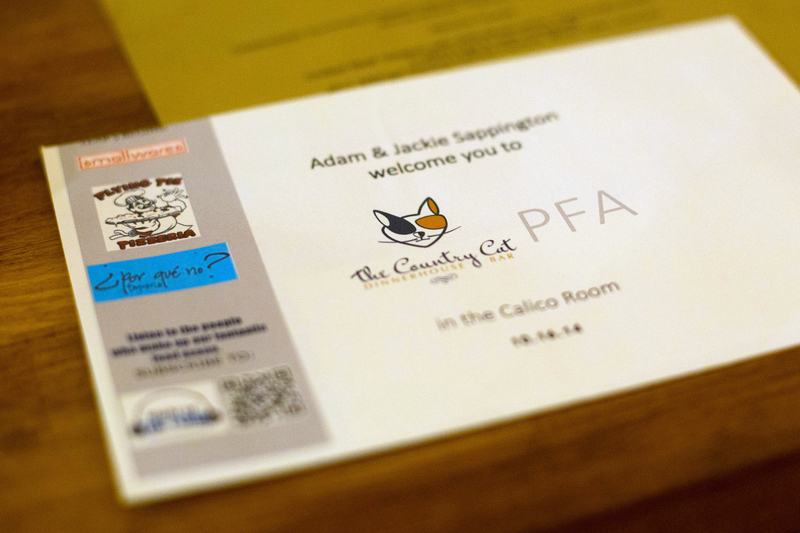 Thank you to the Sappington’s, the great staff of Country Cat and all the attendees for a fabulous night! 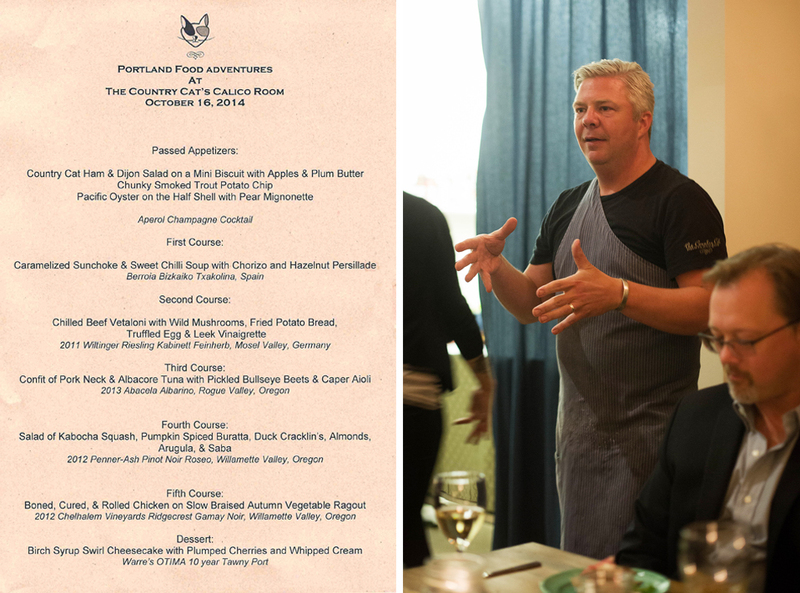 Coming up next is an exciting PFA event: John Gorham will host the premiere of Tasty n Son’s new menu. November 18th at 6:30! 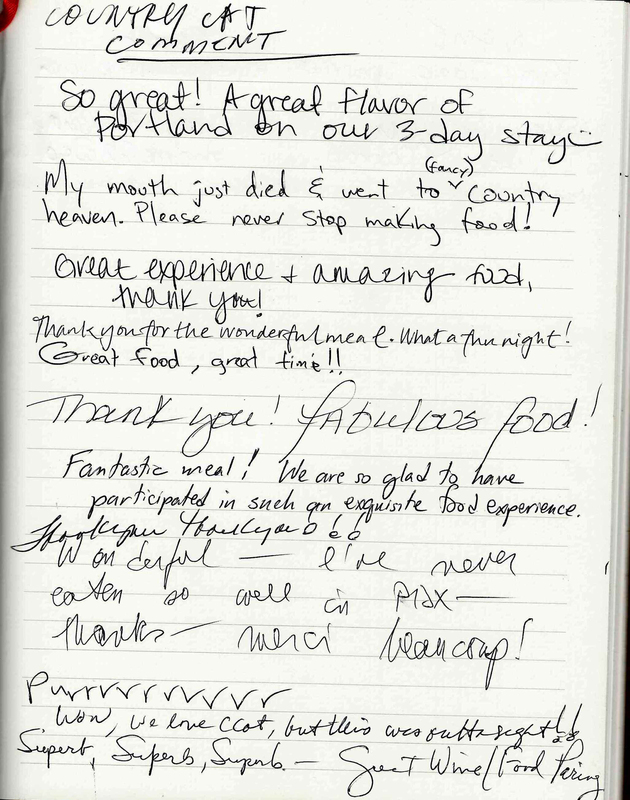 Check out some of the guest comments from this event below!